I’ve published a number of posts about the fascinating past research by Kirabo Jackson (you can see all those posts at You’ll Want To Read This Interview With Education Researcher Kirabo Jackson). Several of his studies have identified the many important impacts teachers can have on students’ lives beyond test scores. Today, he published an article in Education Next (The Full Measure of a Teacher) about his latest research (What Do Test Scores Miss? 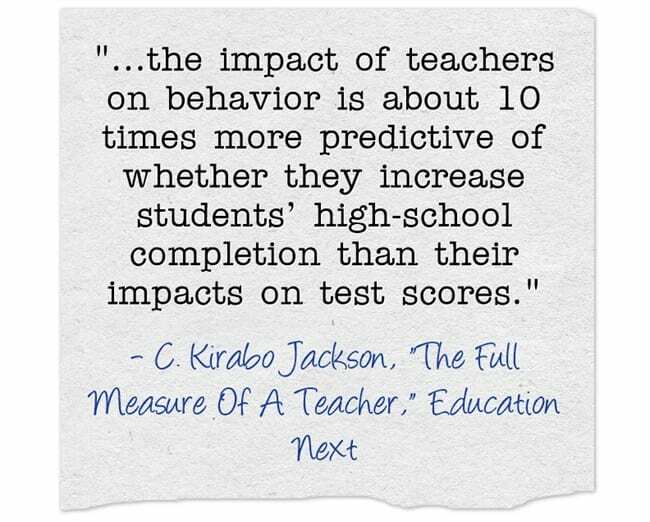 The Importance of Teacher Effects on Non–Test Score Outcomes). As you can tell by its title, this study is along similar lines. Future success includes graduating from high school on time, having a higher GPA at graduation, taking the SAT, and reporting intentions to enroll in a four-year college. He uses a “behavior index” to judge behavior impacts. It includes “the log of the number of absences in ninth grade (plus 1), whether the student was suspended during ninth grade, the GPA (based on all ninth-grade courses), and whether the student enrolled in tenth grade on time. These behaviors are strongly associated with well-known psychometric measures of noncognitive skills including the “big five” and grit.” (from page 2076 of the study). Low agreeableness and high neuroticism are associated with more absences, externalizing behaviors, delinquency, and lower educational attainment ( John et al. 1994; Barbaranelli et al. 2003; Lounsbury et al. 2004; Carneiro, Crawford, and Goodman 2007). High conscientiousness, persistence, grit, and self-regulation are associated with fewer absences and externalizing behaviors, higher grades, and on-time grade progression (Duckworth et al. 2007). His conclusions make a lot of sense to me. I have to admit, though, I have some questions about some of the items he considers under “behavior.” Absences and behaviors are no-brainers, of course. The connection between behavior and GPA, and also to grade progression, though, is not as clear to me, though. I’m exploring the papers he cites, and have also sent a question to him asking if he could help me understand his thinking a bit more. I’ll update this post with what I learn….